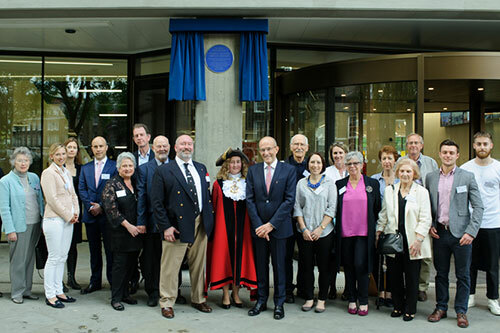 City, University of London has held a commemorative event and exhibition in honour of pioneering engineer and former resident of Northampton Square, Sir Henry Bessemer (1813 to 1898). City discovered recently that from 1833, Sir Henry lived at 15 Northampton Square, now the site of City’s main entrance. The Mayor of Islington, Councillor Una O'Halloran, attended the event to unveil a Blue Plaque for Sir Henry to mark his residence in the Square and recognise his many achievements. Bessemer was famous for devising the Bessemer process for the mass production of steel. The process is thought to be the single most important contribution to the Industrial Revolution as it reduced the cost of the production of ships. During his life, Sir Henry registered more than 100 patents on a wide variety of inventions, from a process to manufacture pencil lead to decorative gold paint. He also received many distinctions and awards during his life, including a Knighthood in 1879. The exhibition and event featured Sir Henry's contribution to engineering and City’s role in its development through research and education. The exhibition, located in the pavilion of City’s main entrance is open to students, staff and the general public and will be on display throughout the summer. It focuses on the history of Northampton Square, Sir Henry's remarkable life and his many inventions. Dr Susan Mossman, Curator of Materials Science at The Science Museum and Mr Jiff Bayliss from Islington Museum spoke about Bessemer's life and work and the history of the local area. We were delighted to discover City’s link with such a historic figure in engineering. It is especially significant given City’s long-standing tradition of research and education in engineering. With our new main entrance located on the precise spot of Sir Henry’s 19th century home, it felt appropriate to honour such an important historical figure with a plaque and exhibition. I hope many people will visit City to discover more about the fascinating life and work of Sir Henry Bessemer. It is a great honour that City is remembering Sir Henry Bessemer with a plaque. It is wonderful that City is keeping his memory alive on the site where he lived at the beginning of his career when he was the same age as most of City’s students. The Bessemer process was the first inexpensive industrial process for the mass production of steel. The process involves blasting compressed air through molten iron to burn out excess carbon and impurities.